I have a real weakness for the shortbread cookie. It could be because of my Scottish roots or that it is a tiny little bomb of butter and sugar and who can resist that! But it is mostly because a good shortbread cookie seems to come along every once in a blue moon so when you see a good one, you must stop shaking your head in disbelief and realize your good fortune is not a mirage. Oh shortbread, you get me every time. The sad news is that shortbread seems to be one of those cookies that, in my humble opinion, never seems to be done quite to my liking. When they are sold out and about in the world they are usually too large for my cookie needs or they are overbaked and lack flavor and for all these reasons they tend to settle back into the case and let the brownies and chocolate chip cookies take all the glory. That’s cool. Shortbread know what’s up. They’ve been around a while so they are happy to let the others cookies have their turn with glory. I received my first ever tin of culinary grade lavender on a semi-recent visit to the San Juan Islands and it was just the inspiration I needed to finally make the shortbread cookie of my dreams. At first thought lavender may not sound like the best addition to the blank cookie canvas that shortbread provides. You may be thinking, leave the lavender for the soap! Or the candles! Just keep it away from my cookies. But you’ll be missing out on some seriously fancy flavor. The cookie I was dreaming up had to include lemon somewhere and at first I wanted to put lemon zest into the cookie dough but I figured that was been-there-done-that. So I decided that a quick roll in lemon sugar while the cookies were still warm would A) make them look pretty and B) give just enough citrus flavor while still letting the lavender shine through. 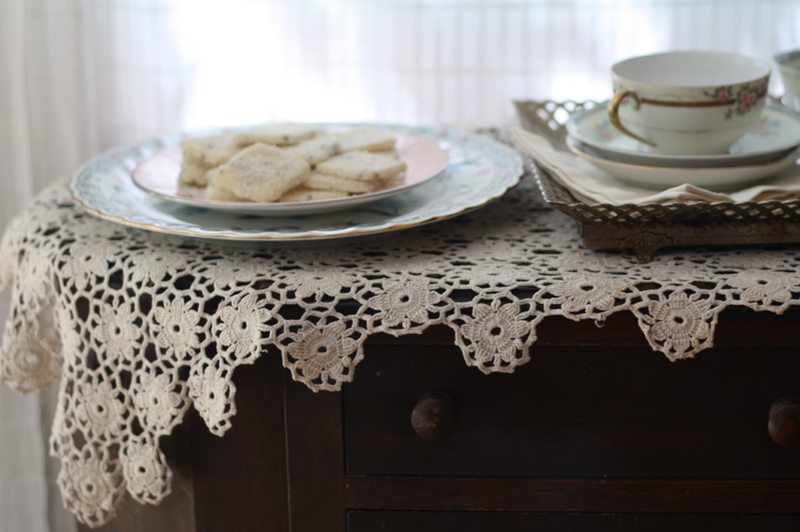 The result is a cookie that is simple and elegant and just enough different for all your summer entertaining needs, and will be happy to have their moment to shine. Now are you wondering where you can find lavender? You can order it online or find it at most Whole Foods Markets. Just make sure you purchase the “culinary grade”. In a medium bowl cream together the butter, sugar, and lavender until pale and well combined. Add the flour, cornstarch and salt until the flour has just been incorporated; being careful not to overmix. The dough will look crumbly. 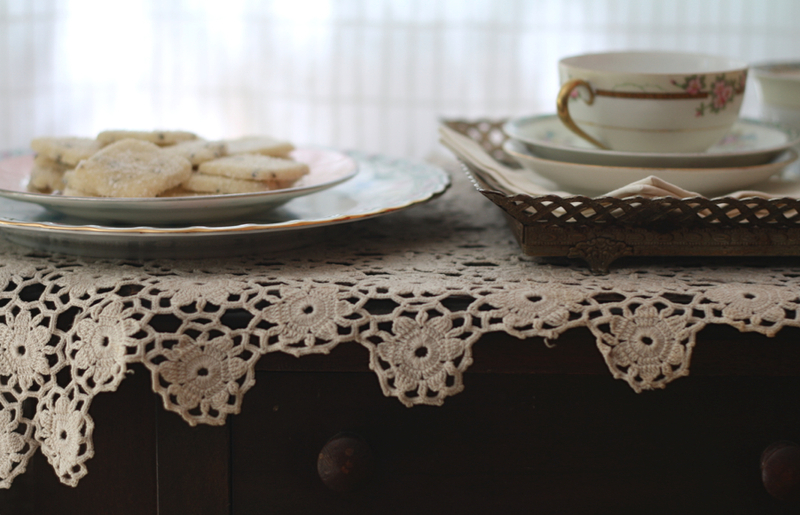 Lay a sheet of plastic wrap on the countertop and pour the shortbread crumbs on top. 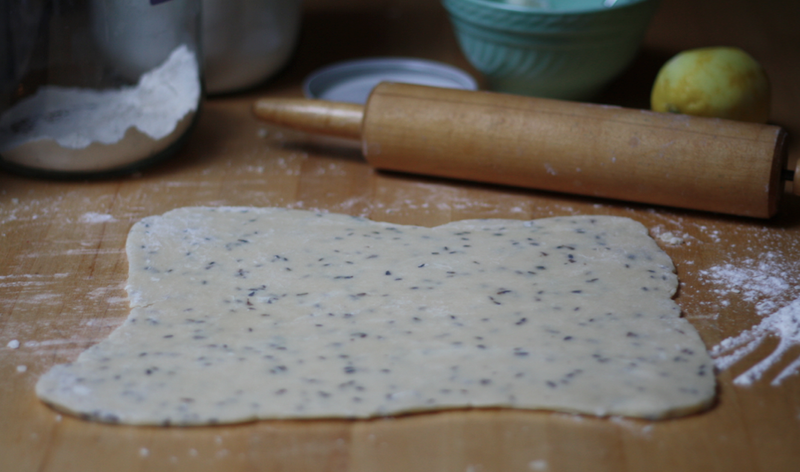 The goal is to touch the dough as little as possible so use the edges of the plastic wrap to gently pull the dough together, pressing ever so lightly as you go, until it holds its shape. 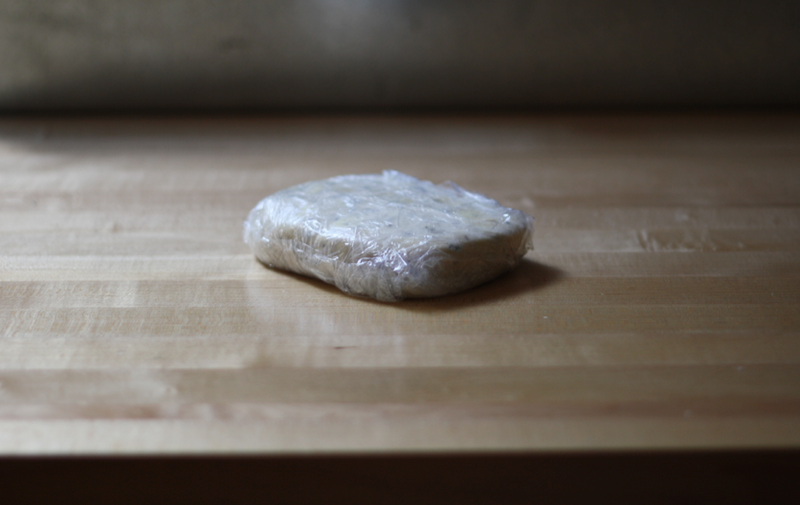 Wrap in another layer of plastic and chill the dough for several hours or overnight. When you are ready to make the cookies, preheat the oven to 325 and line a baking sheet with parchment. 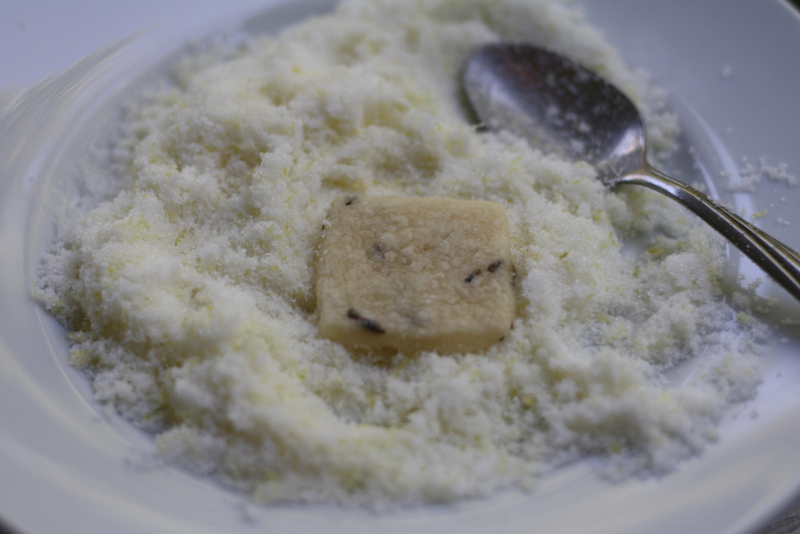 In a small bowl use the back of a spoon combine the sugar and the lemon zest. 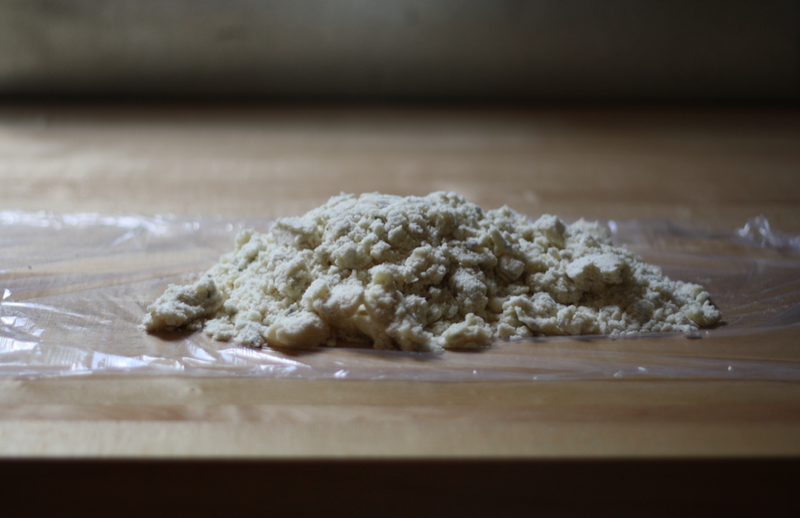 On a lightly floured surface roll the dough to 1/2- to 1/4-inch thick. 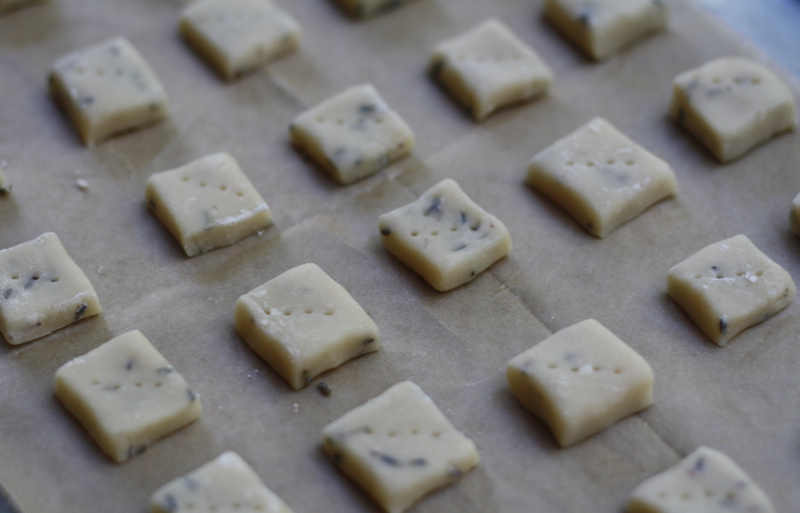 Use a knife to cut the dough into 1-inch squares. Transfer to the prepared baking sheet and prick each cookie with a fork. Bake for 7-8 minutes or until pale and barely golden. Let the cookies cool on the baking sheet for 10-15 minutes then toss each cookie in the lemon sugar. Let the cookies cool completely before storing them in an airtight container. These sound lovely! I wonder…do you think there’s any way to sneak some Limoncello into them? There is always a way to add booze! Maybe by combining limoncello with a little powdered sugar and drizzling the glaze over the top of each cookie? Very pretty! I recently realized the greatness of shortbread. There’s no going back. Thank you. I also am a shortbread cookie fan (and I can be picky, too… For me, it’s got to have high quality butter) and have been dreaming of this very kind of cookie, with lavender. I’m making these as soon as I get home from vacation! Funny that I have recently been obsessed with pure lavender oil mostly for its medicinal qualities but it also smells lovely and these cookies sound nothing short of delightful. Like chocolate, medicinal cookies sounds too good to pass up. I love the lemon touch too. Aww, these remind me of the lavender shortbread cookies at my wedding! Agreed it is a fancy but delicious addition to the classy cookie. 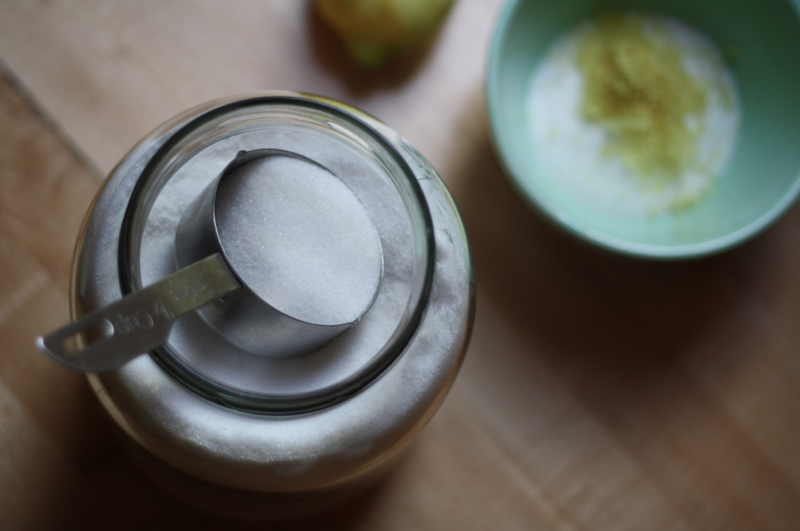 The lemon sugar is a beautiful addition., too. Lil, that lemon sugar is doing it for me. I wasn’t planning on baking this weekend…but….I might have to. I love the delicate flavour of lavender – so perfectly matched with the butteriness of the shortbread and that hint of lemon. You are so right about shortbread being overcooked. I rarely will buy them because they are just ruined when they are too crumbling and dry. It’s like shortbread abuse. Yours look lovely. Nothing like a perfectly prepared shortbread! I love the mix of lavender + lemon in this recipe – two of my favorite things! Absolutely dainty. Have to make them tonite. Been putting together some eggless treat recipes and this certainly fits the bill. Thanks a bunch! Love a good shortbread. I think its because they taste so much more impressive then they look and are much more than the sum of their parts. 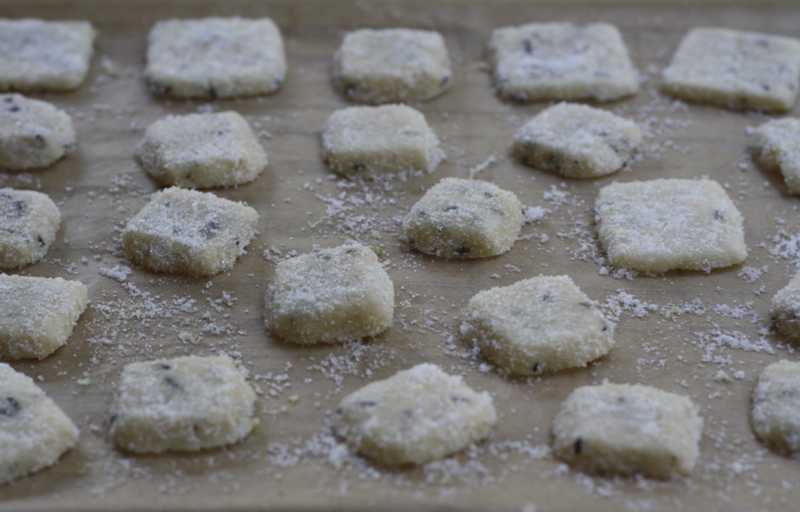 my dough for the lavender shortbread was sticky cake-like mixture, unlike your crumbly texture. after chilling the dough for several hours, it was first hard, but quickly soften to stickiness when thawed. the butter in grams was 170 vs flour & corn flour of 171 gm ratio of which is 1 to 1. so I wonder how to achieve the crumbly stage as show in your photos. Hi Alison. I’m sorry to hear and perhaps you may need to add more flour to the surface when you are rolling them out? It also could be the ambient temperature in your kitchen that caused the dough to quickly soften. I hope that they were at least able to be enjoyed! My family’s one “secret” recipe is a basic shortbread cookie. Cannot wait to try this variation. BTW, Williams-Sonoma sells a good culinary lavender. It also is a very pretty plant, so a nice one to include in a kitchen or window garden. Thank you for this great site! How many gramm butter did you use? Each stick is about 115 grams so I used roughly 172 grams of butter. Happy baking! Yes, dried works great in this recipe! I’m wondering about the proportions of fresh vs. dried lavender. Often fresh is 2-3 times more than dried. But I wonder if that might be overwhelming with the lavender. Any guidance here? I have the fresh lavender I’d like to use now.